The Italian version of this post has first appeared on one of my other blogs, www.dancescriber.blogspot.com, at this address. 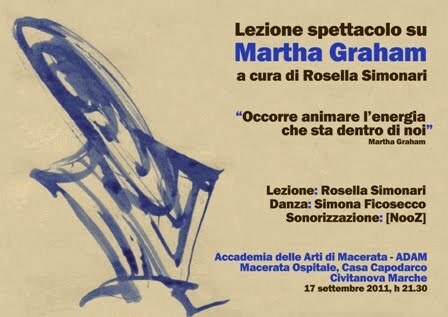 ADAM Accademia (Macerata Art Academy) celebrates Martha Graham twenty years after she passed away with a lecture performance created by myself on September 17th, 2011 in Civitanova Marche. Martha Graham (1894-1991) has been one of the most important figures in the twentieth century, so much so that she has been compared to Picasso and Freud for the scale of her revolution in dance. Her work represents a fundamental stage in contemporary dance history: as has been said more than once, every dancer is Martha Graham's son or daughter, both in the case he or she has continued to work alonge the lines she created and in the case he or she rejected them, as it happened to Merce Cunningham, who danced in her Company for a few years. Graham has been an extraordinary dancer, a remarkable choreographer and has created a dance technique centred on the movement of the torse, a technique which has questioned the supremacy of ballet and the idea that dance should only be an entertaining art. Before her, Isadora Duncan and Ruth St. Denis had questioned these aspects without producing lasting and structurally defined alternatives. Graham, on her part, has managed to delienate a creative corpus capable of facing a comparison with the rich tradition of ballet and with Broadway. Maybe it is for this reason that in 1959 the famous Russina ballet choreographer George Balanchine, father of the New York City Ballet, asked her to collaborate with him at the creation of his new piece Episodes. Many personalities have been seduced by Graham's charisma: Andy Warhol has recreated her image in famous serigraphies, Rudolf Nureyev and Margot Fonteyn have danced in some of her pieces, Liza Minnelli has acted in one of her works, Woody Allen and Madonna have both studied at her school. The lecture performance on Graham is structured according to three lines: one dedicated to the verbal medium and interpreted by myself as dance historian (that is the proper lecture part of the whole event), the second centred on movement and performed by contemporary dancer and choreographer Simona Ficosecco and the third one devoted to sound and mixed by dj [Nooz]. Graham always created spledid collaborations with the people she worked with, such as set or costume designers. The idea is to create an unusual synergy between three different languages which are not usually put together to celebrate Graham's work and to unveil some of its flaws.